Accidents happen. Scratched and damaged paintwork are unfortunately a common occurrence nowadays. Cras are getting wider, parking spaces are getting smaller. This means your pride and joy is more at risk from damage. 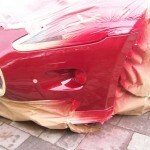 Damaged paintwork looks unsightly and left can lead to problems with rust. It can also affect the resale value of your car. If you have a car on lease or personal hire chances are you’ll need to be keeping it in tip top condition. Giving a car back with damaged bodywork can result in penalties on your contract. We’re mobile. We come to you, be that your place of work or home. Most repairs take under a few hours. We invest the best technology meaning you can drive your car away within hours of us arriving, with paintwork safely dried. 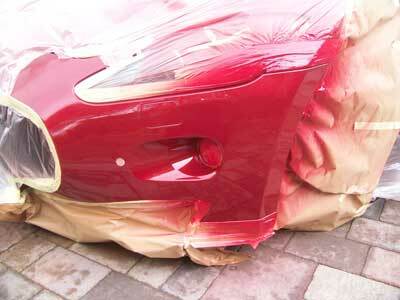 We only use Standox paint to ensure a repair to your car manufacturers specifications. You won’t find a more convenient service. We come to you, fixing your car paint repair in as little as one hour. This means you don’t have to take your car to an overpriced body shop, loosing your car for days at a time. We keep our costs down because we have low overheads, not having to run a garage as traditional bodyshops do. This has the double bonus of lower costs for you and also lower hassle factor for you. We come out to you – saving you time and money. Why not contact us now for a no obligation quote. Our repairs save you money and time. We tailor our service to you. If you’re at work we can come fix your car at work. If you’re at home or on holiday we can come there too. If its raining that’s not a problem either as we put your car under our mobile gazebo to finish it to the highest standards. All our paints are dried using Infra Red heat lamps meaning your car is good to drive after 15 minutes. We centre our service around you and are passionate about making sure your paintwork is repaired to the highest quality.